I wrote about making the most of membership, and taking advantage of family-friendly benefits offered by everyone from the National Trust and English Heritage to supermarkets, banks and building societies. As a family, we’ve enjoyed assorted excitement from tickets to Pensthorpe Natural Park courtesy of Tesco Clubcard vouchers, to an Easter visit to see Kung Fu Panda II via free Club Lloyds cinema tickets and meals at Pizza Express thanks to Nectar points. Forking out for annual membership of the National Trust or English Heritage isn’t cheap, and I definitely weighed up the benefits before paying up. However, individual visits to their assorted castles, houses, gardens and beaches soon add up, so that annual membership can work out less expensive. Total: £108.50 for visiting each of these places once, even without making a detour to Stonehenge (£40.30, another ouch). 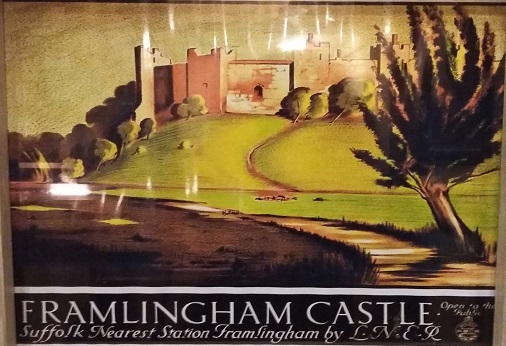 In comparison, annual family membership of English Heritage was £88 at the time, which suddenly didn’t seem so bad. Even better, I only signed up when I found an offer code for 20% off. I also joined online via TopCashback, which meant I got another £5.33 credited back. So in the end, a year’s membership of English Heritage only cost us £65.07. Once you’ve signed on the dotted line, you can then take advantage of the assorted events and family activities on offer, and return at different times of year without paying anything extra. This Easter, we duly headed off to Framlingham Castle to do an Easter treasure hunt. The children raced around following the clues, enticed by the promise of a chocolate reward. 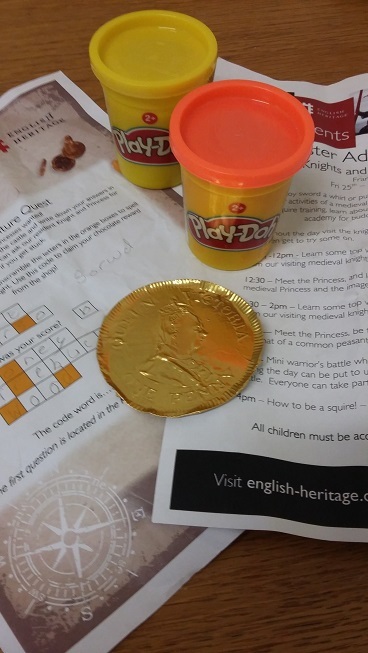 Once they’d discovered all the clues and identified the mystery word, the nice lady in the gift shop handed over a massive chocolate coin and a small pot of Playdoh each. 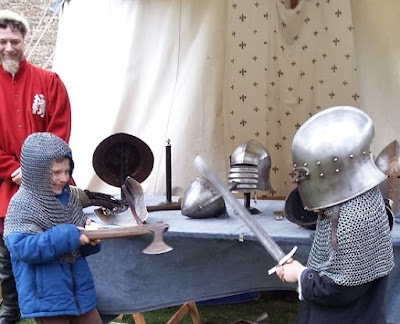 They also enjoyed taking part in a battle scene (luckily with foam swords…), trying on armour and nearly getting blown off the walk round the battlements. 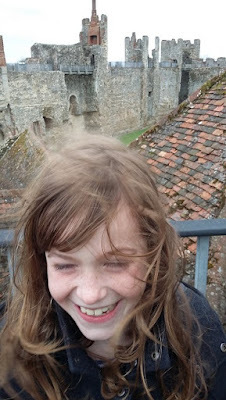 We headed home windswept but happy, and all for the cost of £1 for two pencils because I’d forgotten to bring any pens. Doh. Anyone else found membership schemes with worthwhile benefits? We're members of National Trust (English Heritage have few properties near us) and it is worth it as long as we consciously use them. It's easy to let the year slide without going to any of their properties, but last summer holidays, for example, I made an effort and we went to Waddesdon, Snowshill, Hidcote, Upton House, Charlecote, Farnborough and Stowe. Some of them we just wandered around the grounds; it's nice knowing you don't have to do everything on every visit because you can come back. Yesterday we went to Canons Ashby. My teenagers and very-nearly-a-teenager are pretty good (I know not many 15 year old boys would agree to going) but I find the promise of food (either a picnic or tea and cake in the tea shop as a treat) helps enormously! When the children were younger was to take up offers on some admissions to return again within a year, usually for agreeing to gift aid. St Paul's cathedral did it, I seem to remember, and the excellent Mary Arden's farm in Stratford-upon-Avon, which made it really good value. Mary Arden's is about 45 minutes away from us but often has different holiday days and inset days, so we could have the place virtually to ourselves if we timed it right! We also loved the Ironbridge Gorge museums passport. It's a bit of a drive for us, but we have family in the area so we combined trips. The (admittedly not cheap) passport gives you limitless admission to all the museums for a year. If you haven't been to all the museums, you can still use the passport after the year, but only to visit those museums once. I haven't explained that very well, but I think it makes sense. Blist Hill open air museum and Enginuity were our absolute favourites and we could have visited those two over and over again. Hi Hazel – Great advice about needing to make a conscious effort to take advantage of annual membership. Sounds like you and your family had some wonderful outings! Really worthwhile getting out and about.